Amateur Mormon Historian: George W Brandon writes a Letter. George W Brandon writes a Letter. On July 6, 1842, George wrote the following letter in Nauvoo. George was an early convert to the Church in Tennessee (in 1835?) and he eventually became a local leader in the branch and was called as a missionary there before he emigrated in 1842 to Nauvoo. the location of the Cumberland Irons Works which he names. In as much as I have lately arrived at the place from Tennessee, I feel it a duty that I owe to God and myself and also my brethren to give you a short account of the state and condition of the Church and brethren in the counties of Henry, Stewart and Mongomery, Tennessee, as far as I have knowledge of their standing. I will give a short account of the Charity Branch which branch was raised up by myself in 1839, and was organized with seven members, some of whom lived in Henry County and some in Benton County. Our most usual place of holding meetings was in a few hundred yards of the county line between the aforesaid counties and near to where they cornered. My labors since I was ordained an Elder have been extended from Joseph Chunness on Blood River, Henry County, through the northeast corner of Benton County, thence across the Tennessee River in a southeasterly direction to Wills Creek, thence north across the Cumberland River at the Cumberland Iron Works. Thence a little east at north nine miles to Nathaniel Abners, in Montgomery County . . . My labors were extended, as before stated from Blood River, Henry County, to Montgomery County, Tennessee. Although Benton and Stewart Counties, making a circuit of 80 miles in length. Throughout this circuit I have preached all I could. My circumstances being very limited I suppose I have preached about 500 sermons in the last three years and baptized some 26 persons. My circumstances have been such that compelled me to labor all the while for the support of my family and not only this, I was near $200 in debt, which I had no way of paying only by my labors, which I have paid, excepting a few dollars that was given to me this last spring by my sister, Abigail Brandon. I suppose she gave me as much as $15 in money. A good many of the poor sisters and brothers have helped me to a little provision as they could spare. 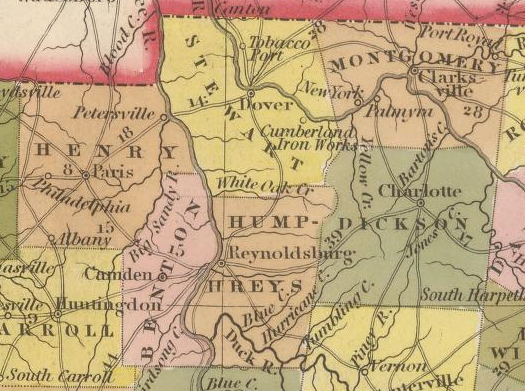 I have suffered some loss by the mobs of Benton and Henry Counties, Tennessee. But out of all these troubles the Lord has delivered me, for which I thank and adore His name. . .